The first cool thing was that we jumped into a boat on wheels and it drove us straight into the water. The second cool thing was this. Jokulsarlon means, “glacial river lagoon,” and that’s where we were. Blue, white, and streaked with black, these gigantic pieces of ice were floating all around our boat with wheels. They had all come from a glacier, were headed to the ocean and were caught up in the lagoon for the time being. 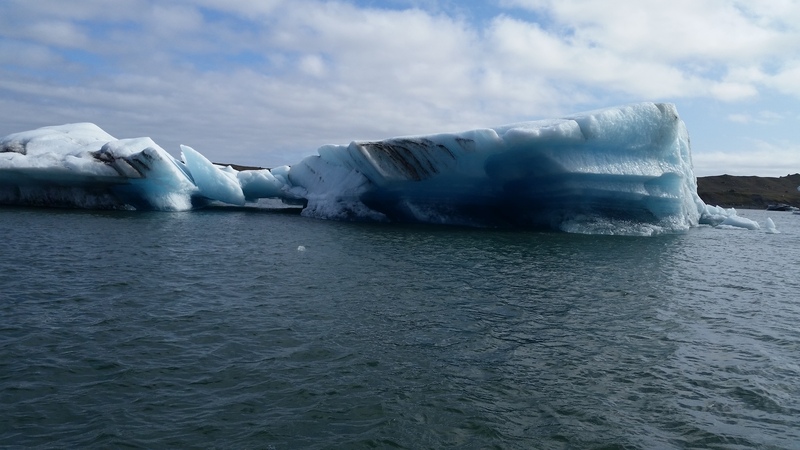 A rubber dingy swooped by to hand our guide a chunk of crystal clear iceberg. After teaching us all some geology and history, she broke the iceberg, passed it around, and we all tried a piece. Or five. As is the rest of the water supply in Iceland, it was so fresh and clean. The kids couldn’t get enough. Ok, neither could I! Take a look at this quick video of our time at Jokulsarlon Glacial Lagoon. Exactly what I hoped to see in Newfoundland but sadly missed the experience.